A quick little break in the traveling silence just to mention that Post-War Trade, the “democratic future of merchandising” dreamed up by Amanda Palmer of The Dresden Dolls, and produced by Katie Kay–indisputably two of the savviest, sassiest lasses I know, whom it was my pleasure to introduce a few years back–is now, finally, up and running as of yesterday! 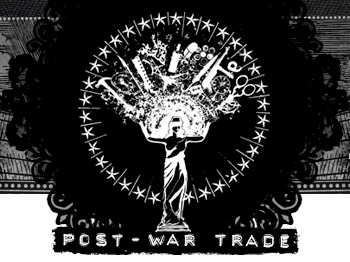 Post-War Trade is a unique merchandising concept using the talent of fans and artists the world over. From toothbrushes to pillowcases, coats to ukuleles, Post-War Trade is the modern answer to band merchandising. Every item is designed and handmade by a talented artist, who shares in the profits from their sale. This creative model supports the designers and creators that help make Punk Cabaret a reality and insures that The Dresden Dolls can offer merch as unique as their music. Good stuff to think about for anyone that’s still confused about ways the music industry might make money, especially now that you can actually Sell Music on Anything! Amanda and Katie – Congrats on the launch of such an auspicious endeavor. Very excited to see this grow!